Taking lessons from Paul was an experience I hold dear to this day. More than just a teacher, he was a mentor and a friend. Being a teen at the time I took lessons from him, life was confusing and scary at points. Through music, Paul really helped me make sense of life and find my place in the world. Now I play in two touring bands, both of which would never have gotten started if I didn’t learn (and earn) the foundation that Paul instilled in me. He taught that only through taking the instrument seriously and believing in myself could I make the progress I desired. For years I played music with him at lessons, jamming, practicing, finding what made it all work for me. I’m still in contact with Paul and when he can he comes out to shows and posts our latest material online. I can honestly say I have never had a teacher like him; a caring, talented and intelligent individual who is super cool to boot. My gratitude is beyond words and one should consider themselves quite fortunate to be learning and playing music with him. Paul was one of several music teachers I’ve had in my life. On a list of about 10 he was by far the most influential. I learned almost everything I know about music from Paul. It would be safe to say that if Paul hadn’t been my teacher I wouldn’t be the bassist I am today, and I wouldn’t want it any other way. About a year and a half before my wedding I started taking bass lessons with Paul. My goal was to surprise my husband and play “Smooth” by Santana for him. Here I am and I rocked it thanks to Paul! Paul Vario is a phenomenal music teacher and Paul Vario Music is the only place to learn how to play the instrument of your choice. It has always been my dream to learn how to play the guitar and thanks to Paul I am making my dream come true. I have been taking guitar lessons with Paul for a year and a half now and have built up an excellent repertoire of skills. His teaching style and ability to communicate with his students is second to none and unlike so many teachers out there he genuinely cares about his students and their progress. Paul’s lessons are always fun and educational and I can not wait to get home and practice what I learned. If you want to learn how to play an instrument in the Bayside area of Queens NY, Paul Vario is the only teacher you need to contact. 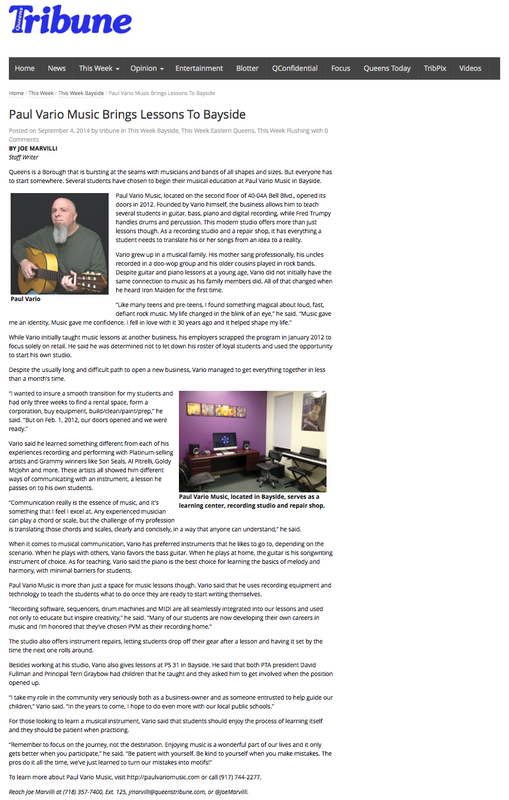 Although I’ve dabbled with the guitar for many years, I began taking lessons from Paul Vario eight months ago and find that he has whet my appetite for serious learning. He’s a bona fide musician who is well versed in a variety of styles. Paul has a knack for conveying musical ideas so that I’m inclined to practice more and more new material while still leaving myself time to play what I enjoy when relaxing at home. I like that Paul tailors our exercises based upon mutually agreed goals and I see real improvement in my playing and more self-confidence in my musical abilities. While usually an empathetic listener, he is quick to demonstrate corrective action and demand adherence to proper technique and I’m a better player for it. We met Paul through PS94 After School Program and formerly The Music Zoo of Little Neck. Since May of 2011 when my son was 8, he has been studying guitar with Paul. Not only is he having a great time but also has found a new way to express himself via music and it’s great for us as parents to share those moments with him. Then about 6 months in, my 6 year old daughter wanted to jump in on the act and she is also progressing well with her guitar journey. Paul is always patient and an excellent communicator. He is meticulous about providing feedback on both of my children and it amazes me how well he is able to read their reactions. I believe these aspects are the most important attribute that any instructor can possess. Paul goes over that week’s lessons with me in detail and the upcoming week’s practice guidelines so the kids can make the most of their practice sessions. I absolutely recommend Paul Vario for anyone who is interested in learning the art of the guitar for themselves or for their children. In March 2011 my son (6 at the time) wanted to learn how to play the guitar. 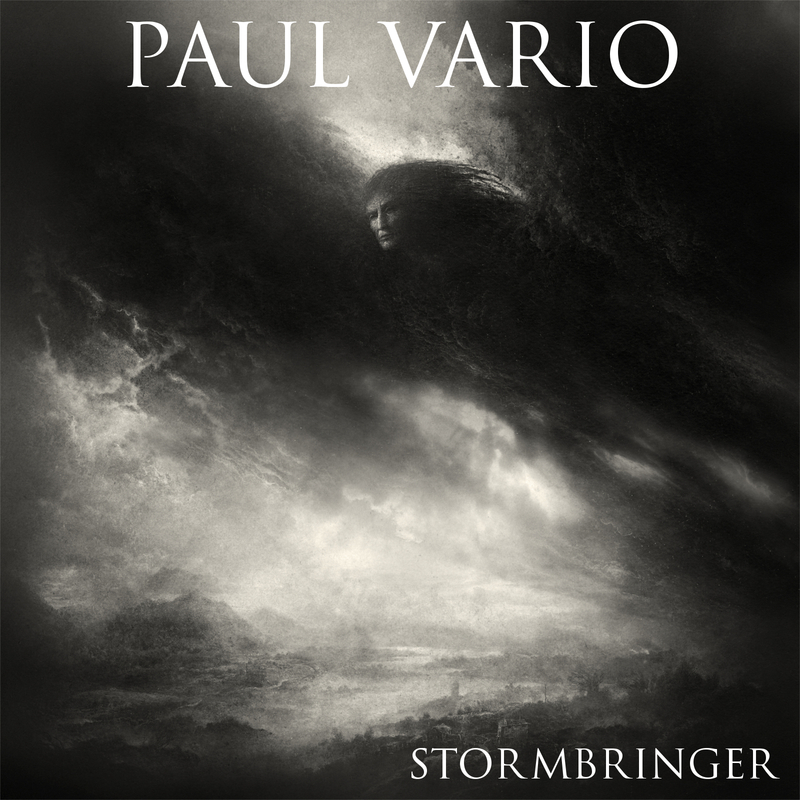 Paul Vario came highly recommended to me and my wife by some friends. After meeting Paul for the very first time and seeing how he interacted with my son I knew this was going to be the right person to guide my son with his musical endeavors. After several lessons, I decided it might be fun for my son and I to learn to play guitar together and I started taking lessons with Paul as well. Through Paul’s guidance, true caring for his students and years of experiences he has given a gift to me and my son that we will be able to share together for the rest of our lives. It was apparent from the very first lesson that Paul truly loves what he does, loves to teach both children and adults and truly takes pride in seeing his students grow no matter if music is a hobby or a career path. Words cannot describe the joy I have seeing my son play some of my favorite music and the pride he has in his accomplishments after leaving his music lesson. Thank you Paul for being who you are and sharing your special gift of music with me and Braden! As I was moving closer to 40 years old, I was having a sort of mid-life crisis and wanted to scratch some things off of my “bucket list”. One of those things being learning how to play the guitar. I first met Paul at The Music Zoo with my $80.00 Toys R Us guitar and right from the start he taught me how to play two easy songs. This put a tremendous smile on my face! I told Paul that one of my dreams was to learn the beginning of “Unchained” by Van Halen being a HUGE Eddie Van Halen fan. Not only did he teach me that song but a few other VH songs as well, breaking them down and making them easy enough for me. Thanks to Paul, what started as a hobby has turned into an OBSESSION with me retiring that Toys R US guitar and purchasing 3 others much to my wife’s dismay (a Fender, a BC Rich and a Sterling by Music Man….just like EVH!!!). Paul is a consumate professional showing great patience while teaching and open to answering any questions I may have in the process. I could have never been this skilled at my playing if it was not for him. He can pretty much take any student and make them a guitarist and let them have fun as well. An absolute gentleman as well, I will be learning from Paul untill my fingers fall off and they physically remove the guitar from my hands. I HIGHLY advise anyone who wants to learn guitar to call Paul first because he will take you to the next level in playing. I have two boys, 8 & 11 years old. They took lessons with Paul at the Music Zoo. In the time that he started teaching my kids, I can honestly say that their enthusiasm and love for music changed drastically. Besides teaching them guitar & piano, he gave them confidence, knowledge and sparked a great deal of excitement knowing that they would see Paul once a week. Using his “tools” (as we call it), he showed my eldest how to play along with his iPad and is anticipating being taught how to use GarageBand. I would recommend EVERYONE to use Paul as a music teacher. He is by far more than capable and truly a great guy.